Four smooth-leaved 'Pulaukotok' kale plants anchor the corners of a plum-colored square container while crinkly purple kale springs from the center. Giant rosettes of frilly leaves ― in shades of lavender, deep rose, and pink, as well as crisp white and creamy yellow ― make ornamental kales favorite additions to the winter garden. 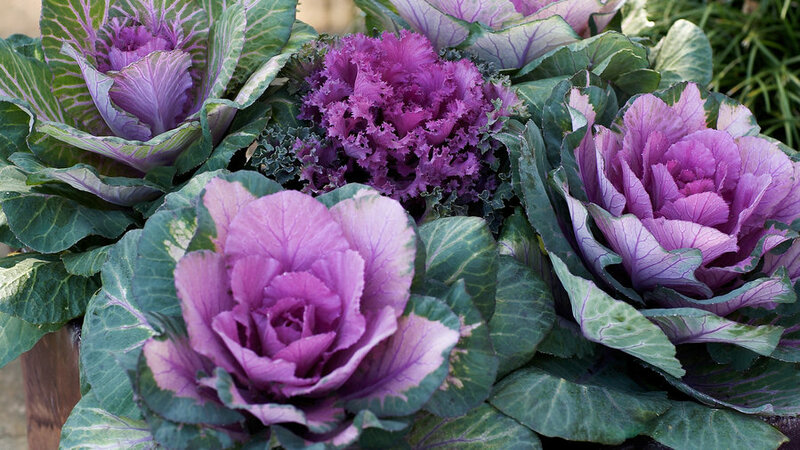 Because these showy cabbage relatives tolerate cold weather and can hold their brilliant color all the way into spring, they’re ideal for growing in pots to display on porches, patios, or beside entryways, or for massing in garden beds. They grow 1 to 2 feet tall. Plant kales as soon as possible so heads develop fully; the color will intensify as the weather cools. Set several kale plants of the same color in a large container, as shown at right, or combine them with cool-season bloomers such as fairy primroses, stock, or violas. Varieties whose leaves are blushed with rose or lavender are especially pretty with blue-flowered violas or lavender stock. Display the pots in full sun or light shade. Water regularly and feed every other week with a dilute liquid fertilizer like fish emulsion. Flowering kale, which has brightly colored foliage, is the most decorative, though some varieties of edible kale are attractive as well. Here are our favorite varieties of each type. For instant effect, buy the largest ornamental kale plants your nursery sells ― typically in 4-inch or gallon-size pots. Edible kales are generally sold in smaller containers or as seed. Also known as ‘Lacinato’ or ‘Lacinatao Blue’, this kale has gently arching leaves that can reach 2 to 3 feet. Try growing this blue-green heirloom edible with curly parsley planted at the base. Or combine it with other beautiful cool-season greens, such as Swiss chard or red mustard. This blackish burgundy edible kale is striking against nearly any color but especially when paired with other kales in shades of hot pink and white, as shown above, or with pink or lavender pansies and stock. Crisp white leaves edged in blue-green look frosty on their own, but they have an especially cool look when paired with white flowers such as Nemesia ‘Compact Innocence’. Other cool-season whites that make pretty companions for this kale include white-flowered forms of cyclamen, fairy primroses ( Primula malacoides), Iceland poppies, snapdragons, stock, and violas.